Mother’s Day is just around the corner. (May 13th!) It’s time to pamper these special women in our lives. Show them how much you love them, and shower them with beautiful gifts ‘by women, for women.’ The female founders in our network joined together for this curated gift guide, which features gorgeous gifts and exclusive offers. Whether you’re shopping for a your mom, grandma, mother-in-law, or a new mom in your life, we hope you will find something she will love. For this mother’s day, send a unique and gorgeous gift box for your mom. Lets thank them for constantly reminding or teaching us small and yet important things in life. Each box includes 2 handmade wooden coasters and an adorable card of your choice, packaged in a beautiful box and sent right to her! Use EXPATWOMANPROMO to get 10% off. The Wine Country Botanicals Pamper Me Gift Box is the perfect present to spoil and indulge that special Mom in your life. The luxurious gold gift box contains a 8.5oz glass bottle of Aloe Vera Bubble Bath, a 8.5oz glass bottle Shea Butter Body Lotion, a 9oz Soy Wax candle and a Perfume Rollerball. This unique body care line- featuring wine country inspired ingredients and therapeutic quality essential oil blends-is sure to bring mom beauty, balance and wellness on her special day. Use EXPATMOTHERSDAY before May 10 and you save $10!. Coffee Vietnamese Pour Over Kit includes five biodegradable pour over filters, pre-filled with premium dark roast coffee sourced sustainably from organic farms in Vietnam, and five individual packets of real California sweetened condensed milk, for the best authentic and elevated Vietnamese coffee available in the US. Coffee makes a great gift for moms who love adventure, and who appreciate it when companies strive to be kinder to the earth, farmer, and consumer. 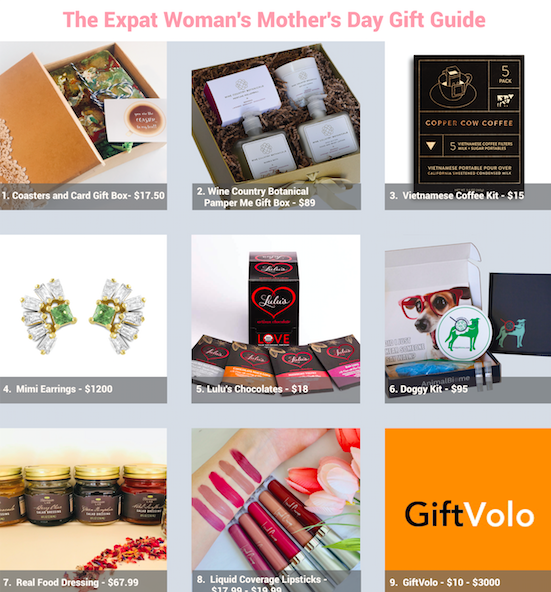 Use EXPAT for 20% off through Mother’s Day. For the dog or cat mom, AnimalBiome’s microbiome assessment kit is a one-of-a-kind gift that offers her a unique view of her furry child. Why is her pet’s microbiome so important? Thousands of microbes in the digestive tracts influence a pet’s health including: proper digestion, mental health and the immune system. AnimalBiome’s kit will give Mom a snapshot of her pet’s gut bacteria, and will provide her with an online tool and personalized support to help her decide if there are steps she can take to improve her pet’s gut health. Use EXPAT20 to get a discount. Give the gift of Courage this Mother’s Day! Liquid Courage is the beauty brand of choice for modern women on the go conquering life, family, career, and everything in between. Treat yourself or the makeup lover in your life with the perfect shade for Mother’s Day. Offering a range of pigmented long lasting lipsticks, Liquid Courage is more than a beauty brand, it’s a lifestyle. Get free shipping when you use discount code ExpatWomen at checkout! GiftVolo enables users to send thoughtful, curated, everyday services to loved ones from local service providers in recipients area. You can send these gifts online in 3 simple clicks. You can send salon and spa services, wine tasting, art and wine sessions, fitness, home services, niche local products or subscription boxes.You can also get a Gift Voucher that is like a universal gift that can be applied to any service on GiftVolo. Use EXPAT18 to get 10% off any service and a gift voucher up to a maximum amount of $100 discount. This entry was posted in Lifestyle, The Expat Mom. Bookmark the permalink.